News and commentary on the world of California politics, policy, and governance, the California Crackup. You might expect, or at least hope, that a city that makes its living providing government for the rest of California would be a place that understands the workings and values of democracy. Two related reactions to the citizen campaign in Sacramento to force a public vote on subsidizing an arena say otherwise. That may be true of the federal government but it hasn’t been true in California for more than a century, ever since Sacramento native Hiram Johnson got voters to approve the initiative, referendum, and recall. “All political power is inherent in the people,” says California’s constitution. “The people have the right to instruct their representatives” and “petition government for redress of grievances.” There’s not a word suggesting citizens must sit around and hold their tongues until the next election. California mixes representative and direct democracy in a hybrid system that’s too often at war with itself, as Joe Mathews and I show in California Crackup. You can argue that California would be better off if Hiram Johnson had never fallen out with his corrupt politician father over “boss rule” at Sacramento City Hall (plus ça change...) and never ended up as a reformer. But if you start your argument pretending the system Johnson initiated doesn’t exist, you’ve only revealed you are a century out of date. 2) And speaking of people a century behind the times, you can’t do better than Sacramento Mayor Kevin Johnson and his team of hired liars. They are demanding that the citizens who submitted petitions against the arena pay to have the signatures counted by election officials. Anyone familiar with the country’s history will hear an ugly echo of the past here. Making citizens pay to exercise their fundamental civil rights is a revival of a kind of poll tax. I wrote earlier this year about the dark side of sports loyalty that reveals itself in battles over subsidizing the home team. But even I would never have predicted that it would end up here: with the first African American mayor of Sacramento wielding a tool of the Ku Klux Klan. In California Crackup, Joe Mathews and Mark Paul provide clear and informed answers. Their fast-paced and often humorous narrative deftly exposes the origins of our current political and fiscal problems—from the ugly 1879 constitutional convention to Hiram Johnson’s Progressive reforms to the Prop 13 tax revolt and its legacy of supermajority requirements and voter initiatives. 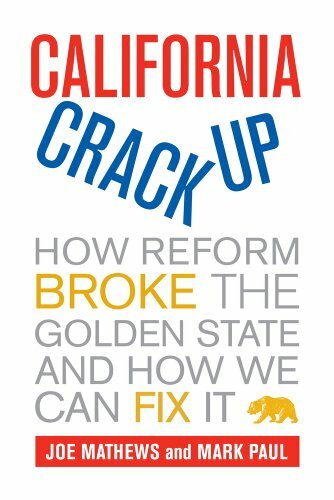 Mathews and Paul then furnish an uniquely California fix: innovative solutions that allow Californians to debate their choices, settle on the best ones, hold elected officials accountable for results, and choose anew if something doesn’t work. Concise, lively, and provocative, California Crackup offers something new: a genuinely democratic operating system for the state. “Indispensable." James Fallows, author of China Airborne. "A compelling book.” Michael Lewis, author of Moneyball.